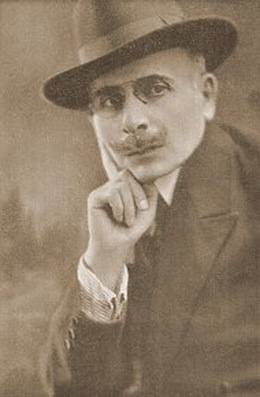 Arshak Abrahami Fetvadjian was an Armenian artist, painter and designer. He is best known for his watercolor paintings of the architectural monuments of the medieval Armenian city of Ani, and for designing the currency and postage stamps of the first Republic of Armenia (1918–1920). As a result of over 20 years devoted to art, Fetvadjian produced no less than 2,000 works, varying from lucid pencil drawings to painstakingly accurate watercolors, that depicted historically significant churches, monasteries, chapels and palaces. A considerable number of his other works were also portraits of Armenians at the turn of the 20th century. Fetvadjian was born in Trebizond in 1866, in the then Ottoman Empire. He attended a national art institute in the city of his birth and continued his studies at the State Fine Arts School (Imperial Academy of Art) in the capital at Constantinople, which had only been recently opened by an Armenian sculptor named Yervand Voskan. Fetvadjian graduated from the academy in 1887 and pursued higher learning abroad: he left for Rome and was admitted to the San Luca Art Academy, where he studied under the wing of Italian painter and sculptor Cesare Maccari. Fetvadjian's artistic talents were brought into the public spotlight when he participated in the Italian national art exhibition in 1891. 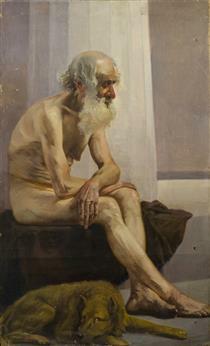 His studies would later take him to Vienna (1891–1895) and later Saint Petersburg. In Russia, he participated in art exhibitions and joined the Russian Artists' Society. Throughout the early 20th century, he continued to hold exhibitions, and his artwork was seen on displays at the Louvre (1919, 1920) and the Victoria and Albert Museum. Arshak Abrahami Fetvadjian (Armenian: Արշակ Աբրահամի Ֆեթվաճյան; October 1, 1866 – October 7, 1947) was an Armenian artist, painter and designer. He is best known for his watercolor paintings of the architectural monuments of the medieval Armenian city of Ani, and for designing the currency and postage stamps of the first Republic of Armenia (1918–1920). As a result of over 20 years devoted to art, Fetvadjian produced no less than 2,000 works, varying from lucid pencil drawings to painstakingly accurate watercolors, that depicted historically significant churches, monasteries, chapels and palaces. A considerable number of his other works were also portraits of Armenians at the turn of the 20th century. Fetvadjian was born in Trebizond in 1866, in the then Ottoman Empire. He attended a national art institute in the city of his birth and continued his studies at the State Fine Arts School (Imperial Academy of Art) in the capital at Constantinople, which had only been recently opened by an Armenian sculptor named Yervand Voskan. Fetvadjian graduated from the academy in 1887 and pursued higher learning abroad: he left for Rome and was admitted to the San Luca Art Academy, where he was taken under the wing of Italian painter and sculptor Cesare Maccari. After Fetvadjian completed his studies in Europe, he traveled to Russian Armenia. He organized several art exhibitions displaying his own works in such major Transcaucasian cities as Batum, Tiflis and Baku. In the early 1900s, Fetvadjian had the opportunity to participate in the excavations led by Russian archaeologist Nicholas Marr of the medieval Armenian capital of Ani, a city which boasted several of the most outstanding examples of Armenian architecture of the High Middle Ages. Some of his most memorable works come from the watercolor paintings of the chapels, palaces, churches and monasteries at Ani which are "factual and literal depictions of the buildings." 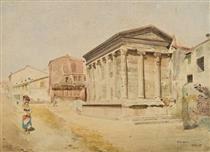 In addition to the historical monuments of Ani, Fetvadjian's paintings also documented other Armenian cultural monuments of the Caucasus (e.g., "Tekor basilica" in Kars), the life and the natural landscape of Armenia (e.g., "Oriental Mail", "Mount Aragats," "Lake Sevan"), and portraits of Armenians and other ethnic peoples. As one of the first artists to depict the Armenian Genocide in art, one of Fetvajian's most famous paintings is the "Sasuntsi Kin" ("The Woman of Sasun"). The painting shows a woman breastfeeding her child, a rifle in hand, with the child in the painting representing Armenia. Following the creation of the [First Republic of Armenia]] in 1918, the members of the country's Finance Ministry commissioned Fetvadjian to draw up the new currency (to replace the Russian ruble) and stamps for the nascent state. The printing was conducted in Europe, and some of Fetvadjian's attractive designs featured animal motifs that were found on the decorations in Ani. But just as the banknotes were being printed in Paris, Soviet Russia was completing its conquest of the republic and by December 1920, the Armenian state was finally absorbed by the Soviets. The banknotes were never put into circulation. Этюд мужчины Arshak Fetvadjian ? Poor old Greek Anatolia Arshak Fetvadjian ?